What Can I Buy For Less Than Or At My Rent Amount? Inventory continues to decline in the wake of Ab 284 and AB 149 (Related Post). In my last post on this subject, found here, there were 215 single family homes available that would pencil out at or near rental rates for FHA loan home buyers. 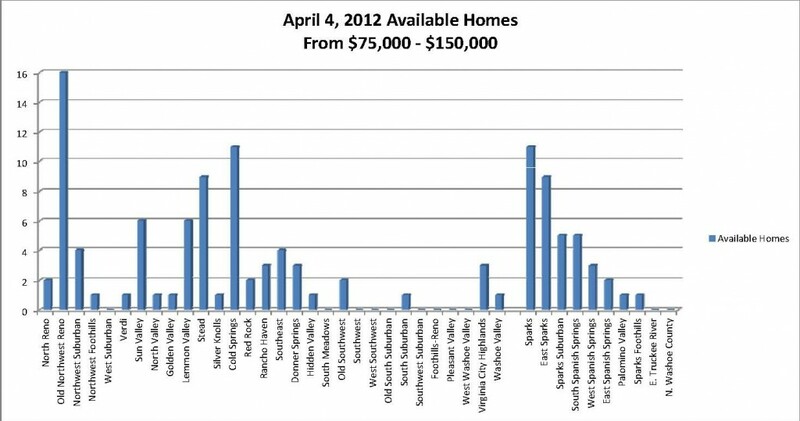 Within a month’s time that number has dropped to 116 as of April 4th, 2012 (see chart below). The lack of inventory is continuing to create stiff competition among buyers as sale prices are trending upward for the short-term. What does this mean for Reno and Sparks home buyers? Multiple offers and a feeding frenzy for homes priced well and in tolerable condition. Time to put your game face on when putting in an offer and watch out for those all cash investors. To view homes that may be as cheap as renting click on the map below. For more information on buying a home or what the market is doing contact Ricky at Ricky@Resnv.com or (775) 750-1437. Posted in For Buyers, Market Update and tagged cheap reno homes, reno buyers agent, reno fha homes, reno fha loans, reno first time buyer homes.